I have always been interested in watching films made in the cities that I've visited to recognize the streets and buildings that I've seen with my own eyes. During my period of fascination with Spanish cinema, I've spent a lot of time watching all sorts of movies, and each time I've seen a street or place that I saw in real life, I got excited. Not a lot of world-wide films have been made in Madrid. We should turn our attention to Spanish movies, but most of them have not gone beyond the borders of the country or have not been translated, and, probably, they will never be. Today I would like to talk about the best movies about Madrid that I have ever seen. The film is about the Spanish version of generation X: twenty-year-old boys who have nowhere to go. Spain, after entering the European Union in the second half of the 80s, begins to flourish; in the 90s, a high standard of living means that adolescents have nothing more to desire: no restrictions, no need for money, no problems. The film's actions take place in the center and north of Madrid, areas where new upper-middle class lives. A company of friends spends every evening in the Kronen bar. They drink, they fight, they wander around the clubs (and I even managed to visit one of these clubs; it's called Templo de Gato) and abandoned buildings, play guitars, and have relationship. The protagonist is played by Juan Diego Botto, an Argentinian (he is one of my favorite Spanish-speaking actors out there). The film very well conveys the atmosphere of Madrid in the 90s, with its traditional character on the one hand and punk tendencies on the other. This is the original movie; the remake of it is called Vanilla Sky. In my opinion, Open "Your Eyes" is better than the remake, and although there is no Hollywood gloss in this movie, it is still better in many ways. It is more authentic and emotional. The film's events take place in Madrid, in the mid-90s. Lots of beautiful scenery can be seen in the movie; it was fascinating to be reminded of all of those places. This is a great movie to watch together. If you don't have someone to watch it with, then be sure to check out this dating site! Young artist Ana arrives in Madrid from Ibiza where she grew up and delves into bohemian life. After the island, the capital seems big, chaotic, and noisy to her. The film is accompanied by touching songs by Antonio Vega, a rock'n'roll legend of the Madrid who died early from cancer. Despite the fact that the film was shot before the large-scale Spanish crisis of 2008-2010, it very accurately conveys the mood of many modern young Spaniards. The main character takes care of his disabled father, works hard as a concierge yet wants a better job and dreams of an expensive suit that is dark blue, almost black. He occasionally spends time on the terrace of a multistory building, from which a view opens onto the sloping Bankia towers and the rooftops of Madrid. This is a story of twenty-year-old lovers. There are no Gran Via and Castellana, but there are Vallecas and Carabanchel to be seen. The film shows the life of the modern Spanish youth, that being without ambition and aspirations, in poverty and with emptiness inside. It can be a bit boring to some, there are lots of super-realistic scenes because of which it can be called an art-house movie. One of the few Hollywood films where part of the action takes place in Madrid, on Castellana Boulevard, Atocha Station, Bailen Street, and Santa Cruz Square. 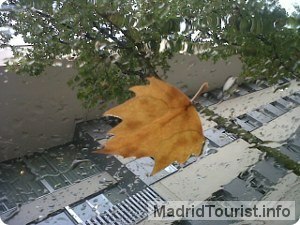 Madrid is one of the main characters of the movies of the most famous Spanish director Pedro Almodovar. According to his movies, one can trace how the atmosphere of the city has changed over the past 30 years. The director himself says that he chose his favorite city landscapes, as well as symbolic and sacred places, for filming. Almodovar shows Madrid as a place of contrast and controversies where there are not only historic buildings, palaces, and beautiful scenery but also slums and humble neighborhoods. Although summer temperatures in Madrid can reach up to 40 ° C, there are a variety of activities that you can cool. 1. Come to any of the parks in the city. Most of them have fountains and ponds that cool the environment; and some you can even dip your feet in the water. 2. In the Retiro park you can lie in the cool grass in the shade of the trees. You can also walk in the rowboats on the lake. 3. Drink a beer with lemon on any terrace. Some of them have a system of water vapor which cools the air and the temperature decreases. 4. In the Casa de Campo you can enjoy its lake, picnic areas and shadows of the trees. 5. Take a stroll through Madrid River. The plenty of trees and the river Manzanares make the temperature drops a few degrees from the city center. 6. You can take a dip in any of the many public pools in the city. 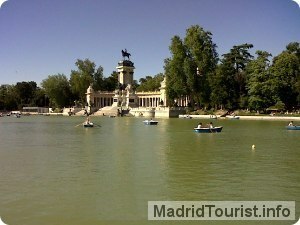 For example in the pool "La Playa de Madrid", in the district of Moncloa. 7. Come to the largest water park in Madrid, Aquopolis, and enjoy your slides: Aquopolis Madrid (there are 2 installations, one in Villanueva de la Canada and one in San Fernando de Henares). 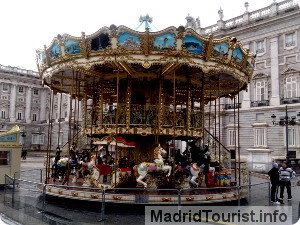 Or cool off in the summer attractions of Madrid's Theme Park or the Warner Park Madrid. 8. And if you still want more cool, very close to the city of Madrid, within the community, there are many forests, dams, campgrounds and recreational areas where you can spend the day or the weekend with much more frigid temperatures. 9. For beach lovers. Madrid has no sea, but thanks to the last lines of AVE, can go from Madrid to Valencia or Alicante in just one hour and a half (2 hours to Alicante). And you will enjoy a fantastic day beach and sea. For anybody with just a few days to spare, Madrid is a great place to visit. This video makes it really simple to get around Madrid and shows how close together most of the tourist places are.